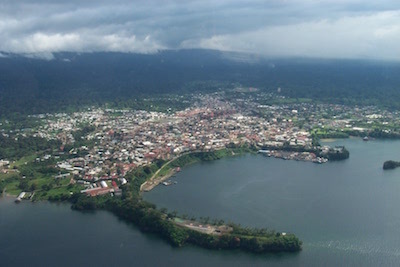 Malabo is located on the northern coast of Bioko Island and serves as the capital of Equatorial Guinea. Malabo is the largest of five islands and is the second largest city in Equatorial Guinea after Bata. Indigenous African peoples in the territory of Equatorial Guinea included Bantu tribes, the Fang, and the Bubi. The Portuguese explorer Fernão do Pó was the first European to discover the island of Bioka in 1472 and Portugal officially colonized it in 1474. In 1778 the land and adjacent islets were ceded to Spain. In 1827, the British leased Bioko Island from Spain and established Malabo (originally named Port Clarence) as a naval station to fight slavery along the West African coast. Fernandinos, as the newly freed slaves who were rescued by the British Navy were called, settled in the town and their descendants can still be found in Malabo today, speaking an Afro-Portuguese dialect. Spain regained control in 1844, after the British moved its base to Sierra Leone. The Spanish renamed the island Santa Isabel. Equatorial Guinea gained independence in 1968 and the current name of Malabo was established in 1973 by Francisco Macías Nguema, who served as the first president. His goal was to replace European names with “authentic” African ones. Macías’s reign was one of terror and near-genocide; nearly one third of the country’s population was either killed or exiled during his presidency. Additionally, the Bubi, who formed the majority on Bioko Island, were decimated. He also brought in many of the Fang, his own tribe’s people who mostly were located on the mainland, to Malabo. Macías was removed from power in 1979 following a coup led by Teodoro Obiang. Malabo serves as the commercial and financial center within the country. The harbor is a critical seaport in the region and exports cocoa, timber, and coffee. The city’s main industry is fish processing. The discovery and development of oil reserves in the country during the 1980s and 1990s increased business and development in Malabo. Oil has brought great wealth to the country, but it is concentrated in the hands of the city’s elite. Several notable buildings include Malabo Cathedral and the Malabo Court Building. Malabo also hosts an international airport. The official language is Spanish but other indigenous languages are prominent as well. Henry Louis Gates, Jr. and Anthony Appiah, Encyclopedia of Africa (New York: Oxford University Press, 2010); Roman Adrian Cybriwsky, Capital Cities around the World: An Encyclopedia of Geography, History (Santa Barbara, CA: ABC-CLIO, 2013).